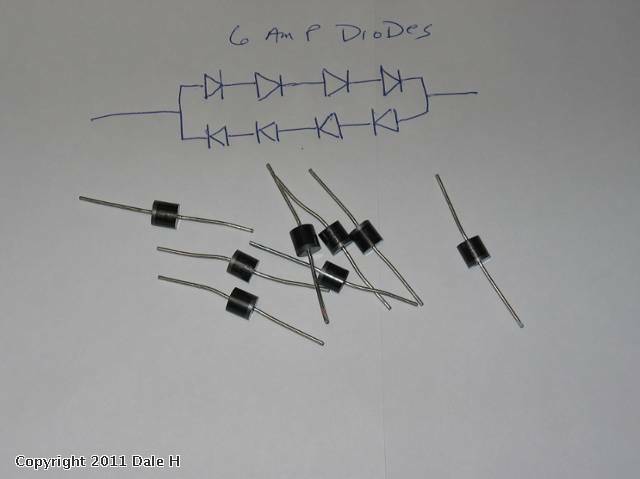 Here are some 6 amp diodes usually available in the parts drawer at Radio Shack. Cost is about 70 cents each. Electrical supply houses have them cheaper in quantity. 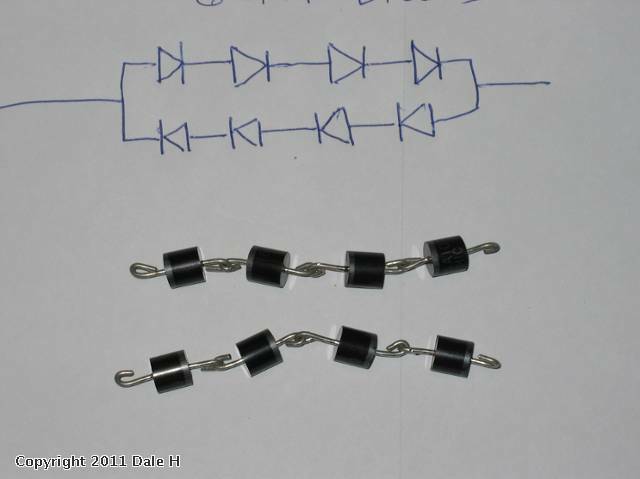 Bend the leads making little hooks at the end,then make 2 chains of 4,crimping with a pliers, all diodes in the same direction (+ is marked with a hash mark) then lay the 2 chains side by side in the opposite direction. tape assembly with good electrical tape. 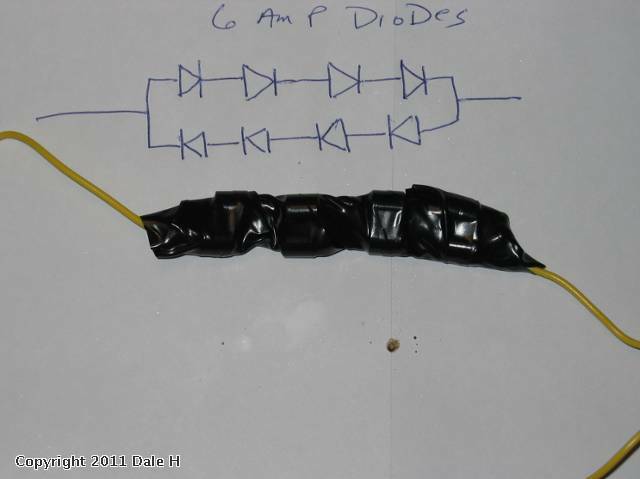 After splicing and insulating the wires so the string is in series with the cut wires, it is secured with tie wraps. In operation the string will get warm. Wattage generated will be 2.4 times the motor amperage drawn. Typically 3-6 watts. So use care with plastic shells,give it a little room to breathe. 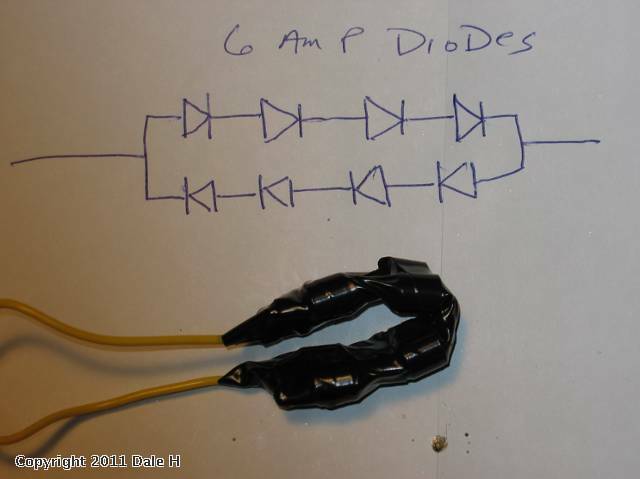 Tapping the 2 ends of the string the voltage across would be + or - 2.4 volts ( polarity depending on engine direction) DC whenever current is pulled through the string. With this voltage a back up light or marker lights LEDs or bulbs could be added. 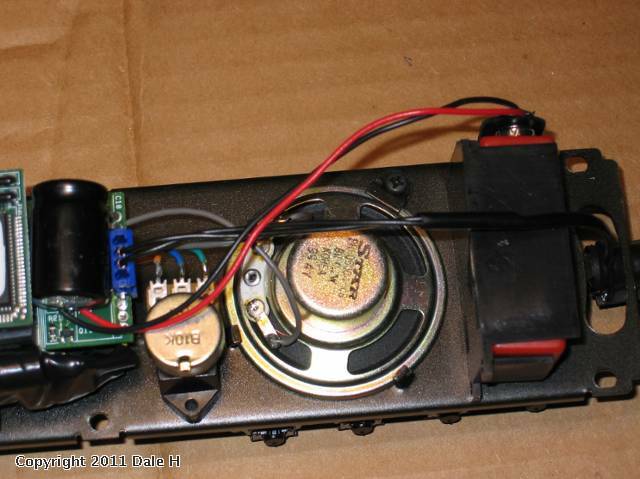 While in here it is a good time to upgrade the cheap stock 8 ohm speaker used. 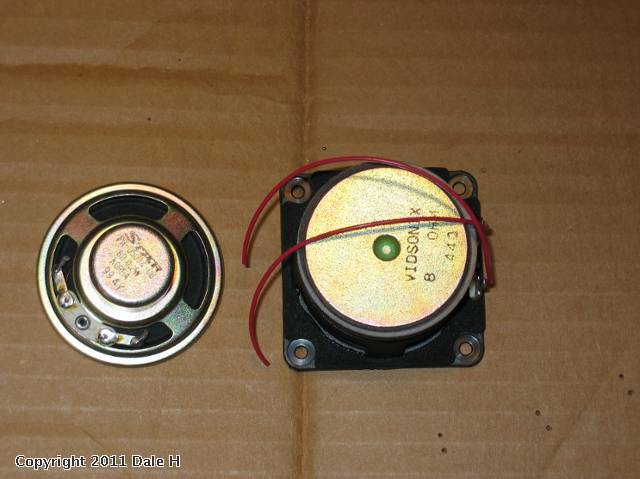 Here is a comparison of the stock speaker with a Digital Dynamics replacement. Since it is much larger it will not fit in all applications. This however is a roomy tender. 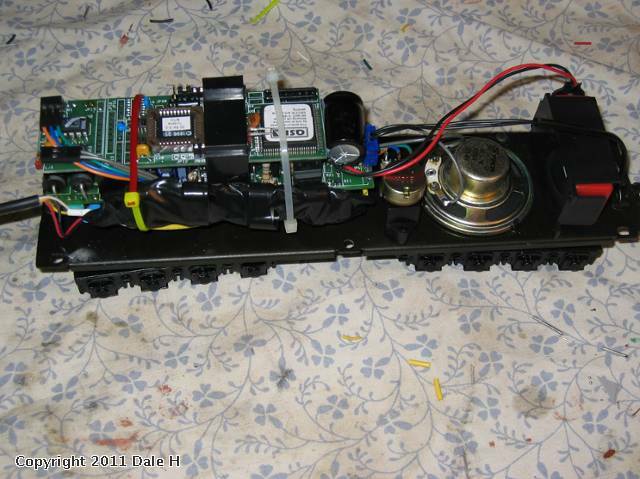 The new speaker is glued in place with gasket silicone and wired in. The new speaker generates more volume and a richer sound. 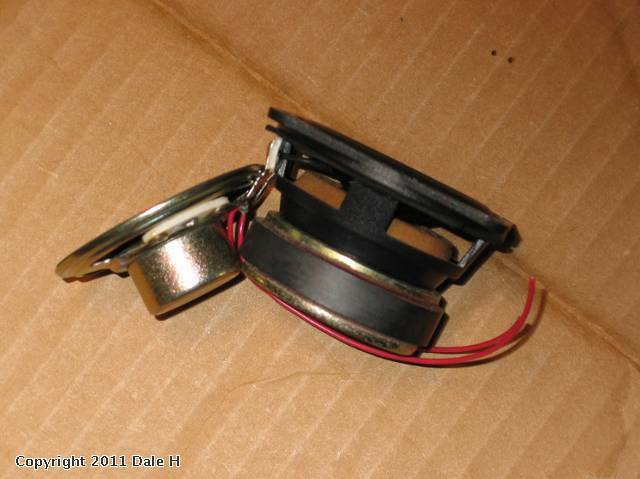 When replacing speakers always match impedance,normally stamped on the back of the speaker. 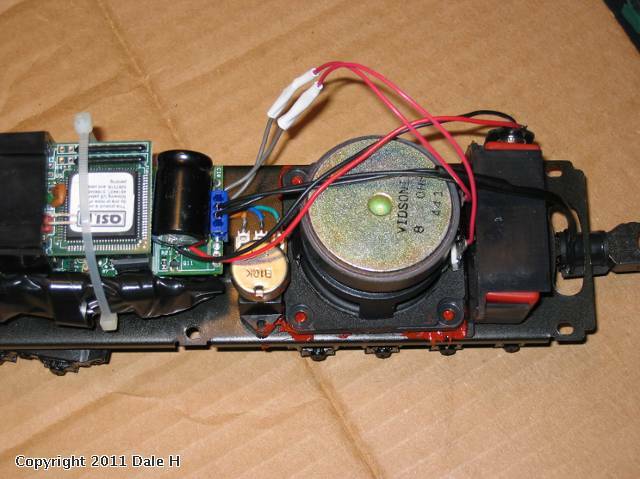 On PS1 steam engines adding diodes may put the chuff out of sync with the speed. since this is a turbine and does not chuff ,it is not an issue. 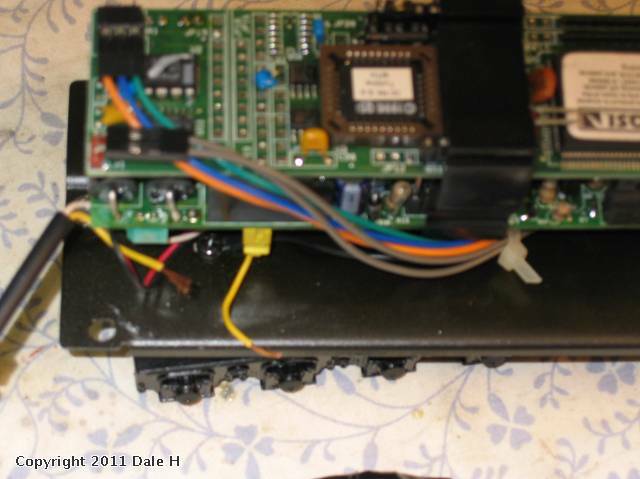 The diodes will work on most conventional engines,single or dual motored if they can be fit in. Excellent walk-through Dale, thank you very much. 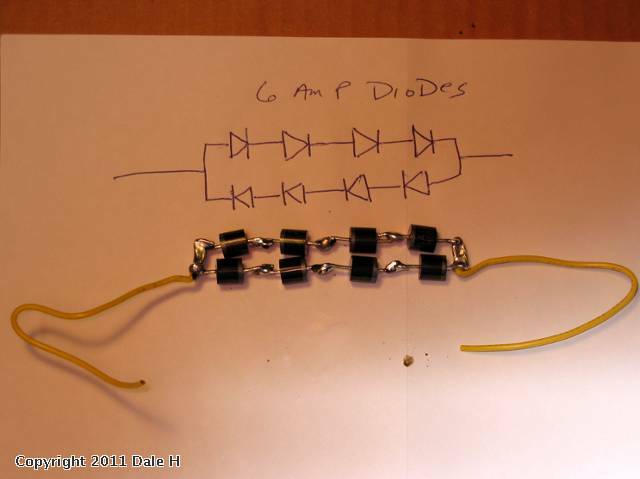 Will the diode fix work with 2Rail? As you can tell, I am electrically challenged . Yes,they will work with 2 rail or in any circuit AC or DC. You can also slow accessories down in the same manner. 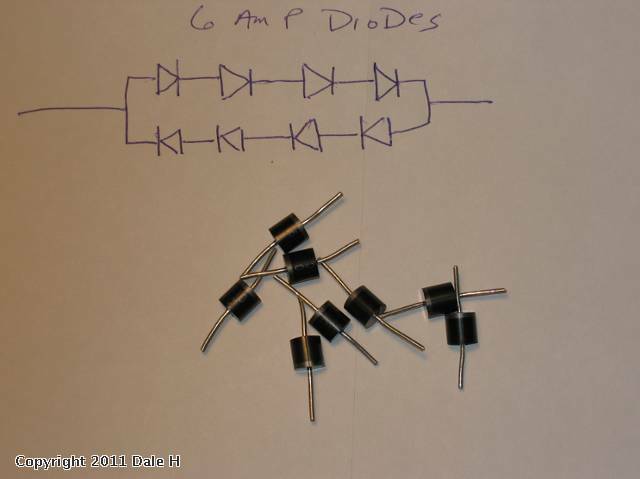 See the topic "dropping voltage with diodes". 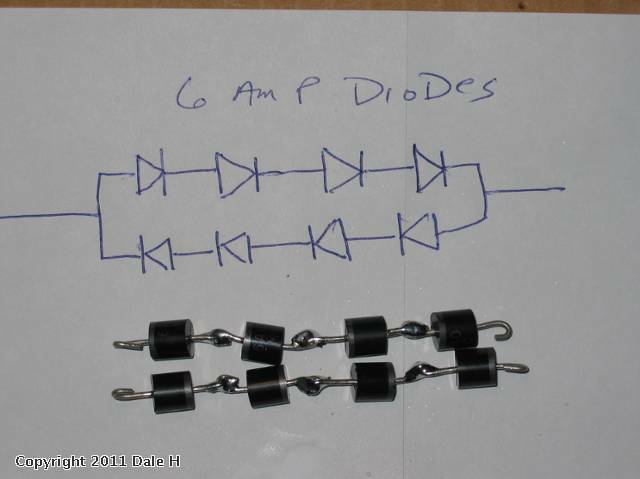 For accessories powered by a DC supply only a single string in one direction in proper polarity is needed.